Today, for something a little different, I want to share two poems with you from the collection Flying for the Window, written by Charles Coté. Charles lives in Rochester, NY, where he practices as a clinical social worker. This collection is his first published collection, poems about his son Charlie, who died of a malignant melanoma in 2005 at the age of 18, right after graduating from high school and while the front man for a popular Rochester-area band, Fivestar Riot. More importantly, Charlie, as I call him, is a dear friend and has been my guide and counselor for the past several years through my own challenging times. Often we talked about poetry, and he coached me on my writing. 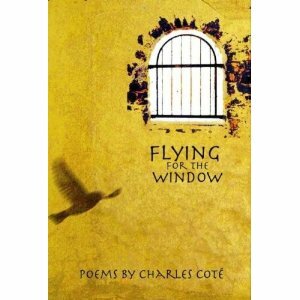 Flying for the Window is available on Amazon, or you can find the book on Charles’ blog. I post these poems with his consent. I love this poem. From the first reading it’s pungency and brevity hit me like a ton of bricks. The turn at the end is magnificent. This poem speaks so well of how I felt about my own loss. off half his head until he shaved the rest. after the surgeon removed his parotid gland. brown eyes, eyes like no one else in the family. king’s cape, singing Better, his best song. That was a year before he died. the night he left us, asking, Are you scared? How do these poems speak to you?